Find out which industries finished on the bottom last year. ETFs are designed to give you diversification in your stock investing. You can get funds that include stocks across the market, or you can choose more-focused ETFs that are more selective in the stocks they include. 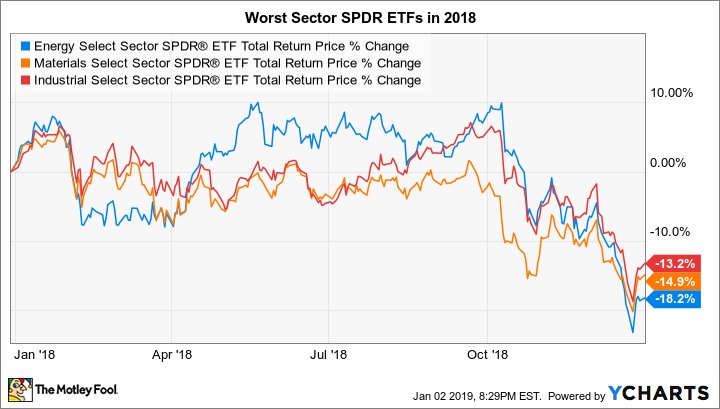 The Sector SPDRs are a family of ETFs that break the U.S. market down into 11 different sectors, giving investors a chance to choose the investments they think will do the best. Overall, the market lost a modest amount of ground in 2018, and some industries performed poorly. Below, we'll look at how Energy Select Sector SPDR (NYSEMKT:XLE), Materials Select Sector SPDR (NYSEMKT:XLB), and Industrial Select Sector SPDR (NYSEMKT:XLI) were the worst performers last year. XLE Total Return Price data by YCharts. 2018 was an all-around poor year for the energy market. Starting near $60 per barrel, the price of West Texas Intermediate crude jumped to more than $75 as recently as October before seeing a two-month plunge at the end of the year. By the time the dust settled, crude had fallen to around $42.50 per barrel at its low, and energy producers and the oil-field services companies that give them the vital support they need were all floundering. It's natural that the energy stocks in the Select SPDR reacted negatively. With top holdings including the best-known names in the business, the ETF lost 18% of its value during 2018. Looking forward, it's impossible to predict with certainty what'll happen in the oil market in 2019, but many are calling for continued weakness as long as the U.S. chooses not to take a firm stand on Iranian sanctions. That doesn't mean all energy stocks are in trouble, but it does call for a more selective approach than a broad-based energy sector ETF can provide. Materials stocks were also hit hard in 2018, with the Select SPDR for the sector taking a 15% hit. Much of the blame fell on the Chinese economy, where slowing growth combined with rising trade tensions with the U.S. to clamp down on prospects in key markets. Of particular concern were tariffs on steel and aluminum, which drew attention to leading players in the industry and highlighted the transition that China is looking to make, moving away from heavy-industry construction toward more consumer-driven economic activity. Yet the materials ETF also had to deal with challenges in other areas. Leading component DowDuPont (NYSE:DWDP) made up more than 20% of the portfolio's weight, and the materials conglomerate was one of the Dow Jones Industrial Average's worst performers. Investors are waiting impatiently for the company to break itself up into three separate pieces, allowing them to focus on what they see as the highest-growth areas for the business. Elsewhere, volatility in precious metals and the threat of rising interest rates on areas like housing took their toll on other commodities. The fate of materials stocks rests largely on whether the U.S. economy can avoid falling into a recession. An economic slowdown could reduce demand for materials even further, but renewed strength in the economy would likely lead to price increases that could reverse the swoon that stocks in the sector have suffered. Finally, the industrials ETF lost 13% on the year in 2018. A couple of factors stood out in the Sector SPDR's decline, most notably the plunge in shares of General Electric (NYSE:GE). The conglomerate is still a top-10 holding in the ETF despite seeing its stock cut in half during 2018, and GE's still trying to figure out a viable strategy for a recovery. More broadly, trade concerns hurt major companies like aerospace giant Boeing and construction equipment manufacturers Caterpillar and Deere, and the ETF also has significant allocations to railroad stocks that rely on free flows of trade goods for much of their revenue. If the U.S. and China can resolve their differences, then it's possible that these stocks will recover in 2019. But given recent rhetoric from Washington, that's far from a sure thing. It's common to turn to beaten-down sectors of the market in hopes that they'll bounce back and produce strong gains in subsequent years. Yet the negative trends that hurt industrials, materials, and energy stocks in 2018 remain largely in place, and so it's anything but certain that the Sector SPDR ETFs in those areas will be the winners of 2019.